Wipf & Stock Publishers, 9781608992089, 107pp. Terry Tempest Williams presents a sharp-edged perspective on the ethics and politics of place, spiritual democracy, and the responsibilities of citizen engagement. 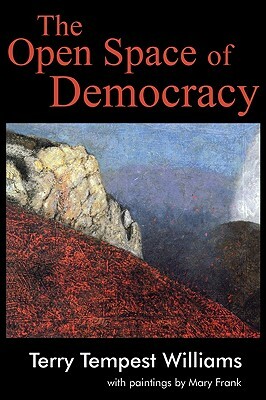 By turns elegiac, inspiring, and passionate, The Open Space of Democracy offers a fresh perspective on the critical questions of our time. ""In a time of despair Terry Tempest Williams offers us hope. In a season of confrontation she provides connection. Against the passions of war she wields peace. To the bray of hubris she speaks quietly of reflection. And all, each magical phrase of it, is rooted in the land she loves."" --Carl Pope, Executive Director, The Sierra Club ""Terry Tempest Williams equates the majesty of our nation's wild places with the essence of America's democracy. Her inspiring essays are thought provoking reminders of the responsibility each of us has to protect and defend these precious gifts. --President Jimmy Carter Terry Tempest Williams blends the symbolism of nature and democracy and draws readers down the road of personal engagement. It is both tough and thoughtful, harmonious and challenging. Her imaginative theory will inspire you to see more, feel more and do more. --Robert Redford The fierce questioning of our American status quo, a hunger for life's essences, a fearless confrontation with doubt and self-doubt--all the exhilarating hallmarks of Terry Tempest Williams' work come sharply to bear here on a central question of our time: Can American-style democracy survive in its birthplace?"" --Barry Lopez Terry Tempest Williams lives in Castle Valley, Utah. Her books include Refuge: An Unnatural History of Family and Place; An Unspoken Hunger; Desert Quartet; Leap; and Red: Passion and Patience in the Desert. Her most recent book is Finding Beauty in a Broken World. She is the recipient of a John Simon Guggenheim Fellowship and a Lannan Literary Fellowship in creative nonfiction. Her work has appeared in The New Yorker, The Nation, The New York Times, Orion, Parabola, and The Best American Essays. She is currently the Annie Clark Tanner Scholar in Environmental Humanities at the University of Utah.